Are these bulbs the latest technology? 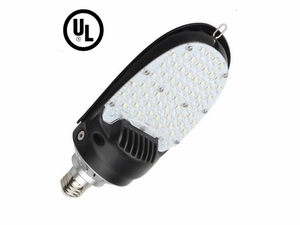 Yes, they use LED crystals with Philips 3030 technology at 110-120 Lumens per watt. The base is E-36. What are some of the other advantages of this LED Replacement bulb? Much easier and quick installation. No need to remove, discard and replace heavy fixtures. Just simply remove the existing HID bulb change the lamp socket wires to the proper input voltage supply and then screw in the bulb.